Progress for Working Women in the U.S.
During the early 1900s, President Woodrow Wilson enacted the proclamation establishing the first Mother's Day on May 9, 1914. Back then, the labor force participation rates for women hovered around 20%, AND astonishingly, women hadn't yet earned the right to vote, given that the 19th amendment wasn't ratified until August 18, 1920 (a full six years later!). Needless to say, a lot has changed over the course of 100 years. Therefore, in the spirit of Mother's Day, let's dive into some interesting facts and statistics about the advancement of working women in the world today. 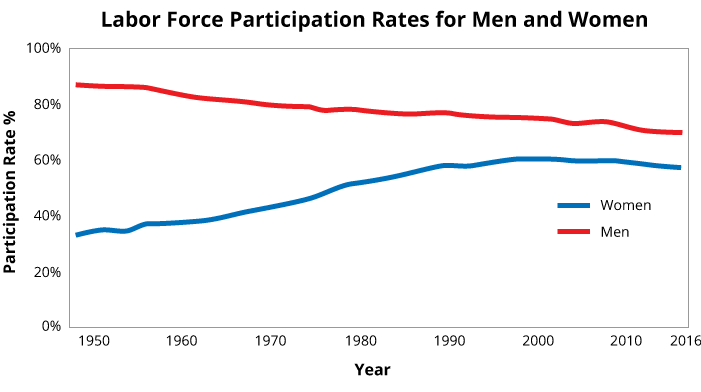 To start, let's look at the labor force participation rates between men and women. Using statistics collected from the U.S. Department of Labor, we can easily visualize the percentage change in the labor force, dating back to 1948. Here we can see that the participation rate curves for both men and women are gradually coming to a close. This surely can be attributed to a variety of social and political reasons, such as public policies, new technologies, and a rise in feminist movements, which have fostered greater inclusion of women in the workforce. It's also worth noting that the decline in the labor force participation rate for men reflects the rising trend of stay-at-home dads. At present day, the participation rate for men is around 69%, while the rate for women is about 57%. Again, using statistics derived from the U.S. Department of Labor, we can easily see that women make up a large percentage of top managerial positions. 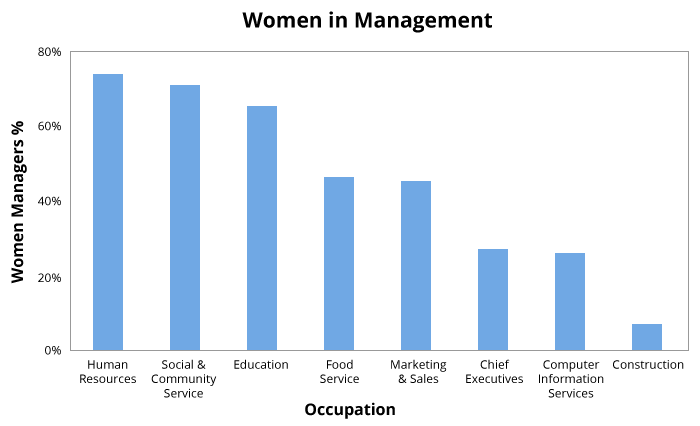 According to this chart, about 74% of all human resource managers in the U.S. are women. That's significant! And while certain occupations (Chief Executives and Construction Managers) have a relatively low women percentage, we can at least see that women have generally gained a greater managerial presence over time. Furthermore, mothers have also modified their roles as managers. Given the rising trend in which 70% of mothers are in the labor force, working moms have had to find ways of adjusting their time management. Pew Research Center has created an interesting graphic that demonstrates this change from 1965 to 2016. 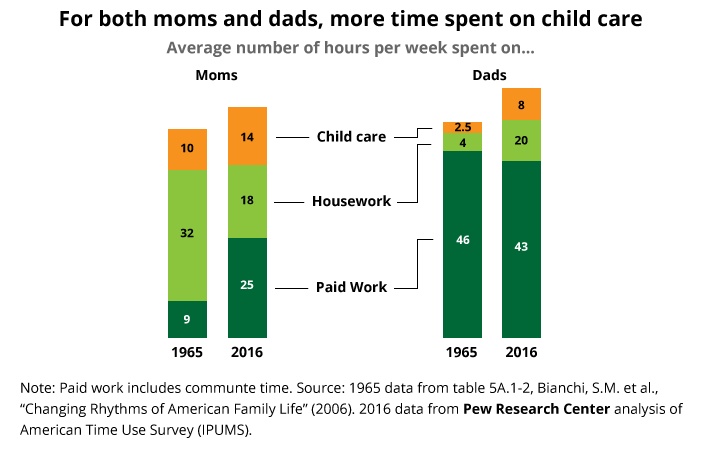 While it's unsurprising that we see a significant increase in the average hours spent on paid work for mothers, it's interesting to note that we also see an increase in the hours spent on child-care. Despite spending well over double the amount of time on paid work, mothers today have had to prioritize what they personally feel is most important to them. As a result, mothers have learned to effectively manage their time and create a greater balance between work and family life. Throughout history, we've seen that women have always worked hard. There's a reason President Woodrow Wilson declared the first Mother's Day back in 1914. He saw that women serve a vital role in the efficiency of our nation as a whole, both in the present and future. 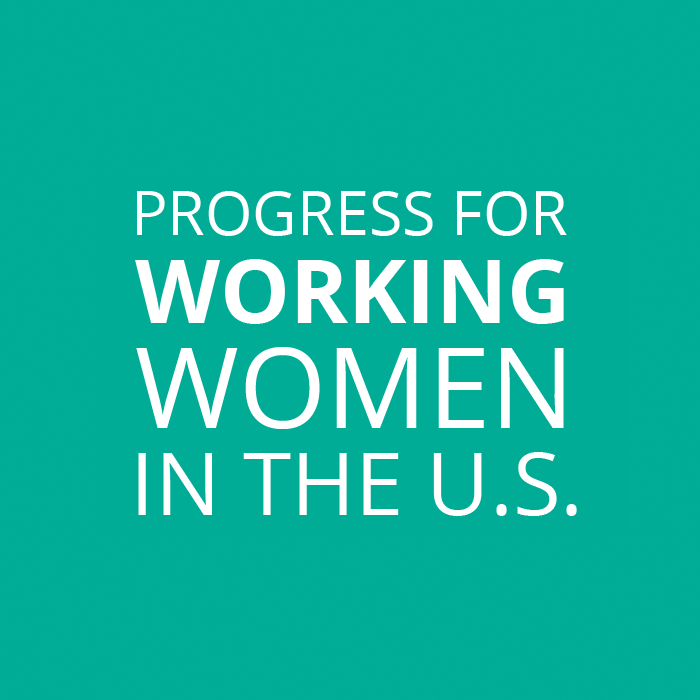 Looking at today's statistics regarding the labor force participation rates, family earnings, managerial presence, and time management allocations, we clearly see that women have continued this trend of working hard into present day.